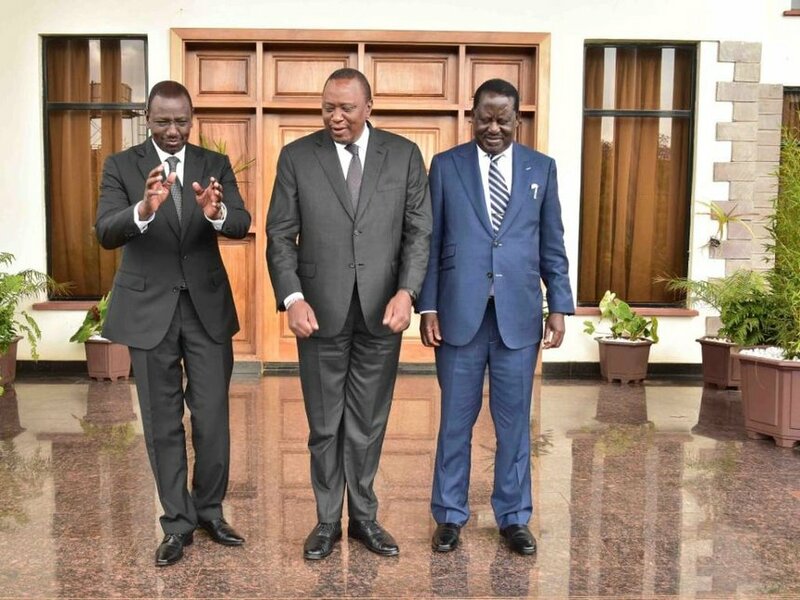 Today, Deputy President William Ruto hosted President Uhuru Kenyatta and former Prime Minister Raila Odinga for lunch. The three gathered at Ruto’s home in Karen, immediately after attending the requiem mass of the late former Maendeleo ya Wanawake Organisation chairperson Jane Kiano at the St Francis ACK church, Karen. Kipchumba Murkomen also accompanied the leaders. Despite several photos being shared online, the details of the ‘lunch’ meeting remain tightly guarded as bodyguards and aides were kept at bay during the meeting. Read: Is Ruto In The Dark Over State House Developments, Left Alone In 2022 Bid? Of late, the three leaders have not been reading from the same page, seemingly Ruto having been kept in the dark of the country’s development at the helm. It is said that Ruto could have been leading a silent revolt from the government, and the meeting was supposed to calm down things. The revolt has been witnessed openly, with MPs allied to DP Ruto’s camp walking out of a president’s function in Bomet. Leaders from Rift Valley have been pressuring the President to declare support for Ruto’s 2022 presidential bid. However, while in Central Kenya, the president that his candidate for 2022 will be a shocker to many Kenyans. On his side, Ruto has been seen to consolidate support for 2022, recently bringing to his camp Senator Moses Wetangula and Bonnie Khalwale. Early this week, the DP visited his nemesis Isaac Rutto, with pundits predicting that he (Rutto) is set for a government appointment.